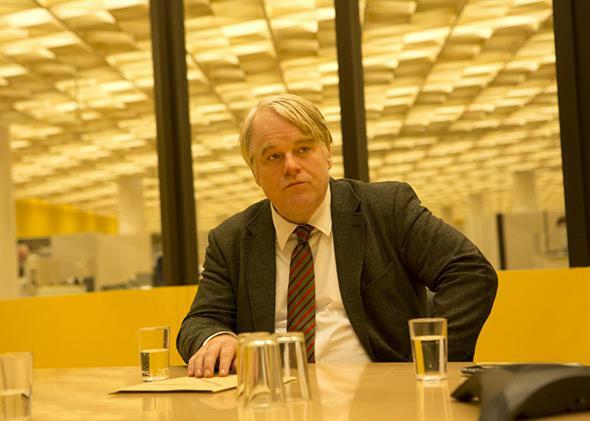 Philip Seymour Hoffman’s final lead role, A Most Wanted Man, reviewed. As he did so many times before, Philip Seymour Hoffman elevates the movie around him. Philip Seymour Hoffman in A Most Wanted Man. As Günther Bachmann, the defiantly old-school German spy heading up the operation, Hoffman is as muted and unshowy as he’s ever been. (Like all the North American actors playing native Germans, he speaks in English with a German accent—an old movie convention that Hoffman, unlike some of his less vocally gifted co-stars, manages to pull off.) Bachmann’s every gesture seems to bear the weight of a lifetime of hard living and disappointment. When he spikes his daytime coffee with whiskey from a flask, or places a protective hand on the shoulder of his right-hand woman at the agency, the loyal Irna (Nina Hoss), we sense a history there: decades, maybe, of needing that drink, depending on that woman. * Bachmann lives alone in semi-squalor, chain-smoking and poring over case notes with a glass of brown liquor constantly at hand. Hamburg, an opening title reminds us, is where Mohammed Atta spent the better part of a decade helping to plan the Sept. 11 attacks. Though he never speaks of it directly, Bachmann is clearly haunted by guilt over that fatal security lapse (as well as another darkly alluded-to disaster in Beirut). Bachmann’s agency is now surveilling Issa Karpov (Grigoriy Dobrygin), a half-Chechen, half-Russian man who’s been ID’d by Interpol as a suspected jihadi. Karpov is in Hamburg trying to secure a large family fortune from a dodgy German banker (Willem Dafoe) with the help of a left-wing human rights lawyer (Rachel McAdams). But Bachmann is less interested in apprehending Karpov than in using him as bait to lure a potentially much bigger fish: a prominent Muslim scholar (Homayoun Ershadi) whose public image as a voice of moderation Bachmann suspects may be hiding a secret life as a terrorist money-launderer. A Most Wanted Man (which was scripted by Andrew Bovell, based on a 2008 novel by le Carré) seems more interested in the theory than the practice of spying. Bachmann runs a different kind of shop than his colleagues in U.S. intelligence. He’s playing the long game, using surveillance as a tool to prise open whole networks, while the CIA (represented by Robin Wright’s ice-in-her-veins operative) seems more interested in seizing every low-level suspect they can get their hands on. Bachmann’s patient, unorthodox approach to spycraft finds its equivalent in this movie’s deliberate, sometimes stolid pacing. There are no car chases; no gunplay; and a single, vaguely comical fistfight, inserted mainly to emphasize the point that, even when motivated by righteousness, the impolitic Bachmann is his own worst enemy. A Most Wanted Man isn’t quite as minimalist as Corbijn’s last film, the studiedly existential and nearly dialogue-free George Clooney vehicle The American, but it’s no Bourne Identity thrill ride by a (merciful) mile. The reason to stick with it through the longueurs is for its central character study of a brilliant spy gone to seed. Philip Seymour Hoffman is—or, goddamn it, was—a virtuoso at playing men like Günther Bachmann, lonely monomaniacs whose character weaknesses and poor lifestyle choices don’t make them any less vibrant, sympathetic, and riveting to watch. (The gambling addict of Owning Mahowny, the gasoline-huffer of Love Liza, and the obscene phone-call-maker of Happiness all fall into this category, as does Hoffman’s blustering CIA agent Gust Avrakotos in his last spy movie before this one, Charlie Wilson’s War.) Whether or not he was in bad shape vis-à-vis his own addiction while playing this role, he inhabits it with the insight of a man who’s been to some pretty dark places and back. When Bachmann wakes up, sits on the edge of his bed, and immediately takes a fortifying slug from the glass of whiskey on his nightstand, Hoffman doesn’t play the moment as a familiar tough guy in a spy movie might, knocking the drink back impassively. Rather, he allows us to see his character in a moment of craving, vulnerability, and need—a rawness that’s evident again near the end of the film, when the normally tight-lipped Bachmann unleashes a sudden howl of rage. If Hoffman had lived (once again: goddamn it), A Most Wanted Man would have been just one of the many pretty-good films he could always be depended upon to appear in along with the (also plentiful) great ones. They weren’t all Masters and Capotes and Talented Mr. Ripleys; in between there were always movies like Pirate Radio or The Ides of March or Charlie Wilson’s War or even, God bless its soul, Twister—imperfect movies whose limitations were easier to overlook because of the extra measure of depth and attention to detail this actor reliably brought to even the smallest roles he played. And when Hoffman went in to rescue a film, it wasn’t an every-man-for-himself mission; he was a deeply relational actor whose rising tide lifted the boats of everyone around him. One of the countless sad things about losing Hoffman is the realization that we’ll never get to watch him single-handedly elevate an otherwise OK movie again.